Investment in the reduction of a population’s exposure to cancer risk factors is a long-term investment in the health of the population, which will also reduce the overall burden on the health system. Effective cancer prevention at the national level begins with a national cancer control plan (NCCP) that responds to a country’s cancer burden and cancer risk factor prevalence. A NCCP is designed to implement evidence-based resource-appropriate policies and programmes that reduce the level of exposure to risk factors for cancer and strengthen the capacity of individuals of all ages to adopt lifestyle choices that promote good health for life. With the right strategies, the World Health Organization estimates that 30 to 50% of cancer cases could be prevented. Tobacco use is linked to 71% of all lung cancer deaths, and accounts for at least 22% of all cancer deaths. Alcohol is also a known risk factor for cancer and is strongly linked with an increased risk of cancers of the mouth, pharynx, larynx, oesophagus, bowel, liver and breast. 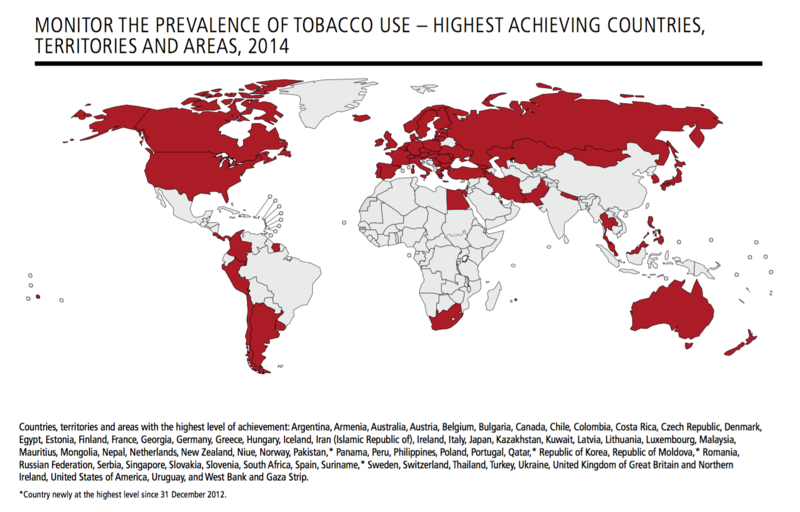 WHO Report on the Global Tobacco Epidemic, 2015. Alcohol is also a known risk factor for cancer and increases the risk of cancers of the oesophagus, bowel, liver, breast (pre- and postmenopause), stomach, and mouth, pharynx and larynx. Much of the world is experiencing upward trends in overweight and obesity and of particular concern is the increasing rate of obesity in children and adolescents. Overweight and obesity increases the risk of oesophageal, pancreatic, liver, bowel, breast (postmenopause), endometrial, kidney, stomach, gallbladder, ovarian, prostate, and mouth, pharynx and larynx cancers. Protection from ultraviolet (UV) radiation is critical for skin cancer prevention. In 2000, excessive exposure to UV radiation caused 60,000 premature deaths most of those as a result of recreational exposure. 177,000 cancer deaths each year are related to occupational exposure to selected carcinogens, with one in every three deaths caused by asbestos. Air pollution is a major environmental risk factor for cancer. The most recent data indicate that in 2010, 223,000 deaths from lung cancer worldwide resulted from air pollution. A life-course approach to prevention is a core principle of the WHO Global Action Plan for NCDs 2013-2020 seeking to address exposure to risk factors at all ages and stages, including during childhood and adolescence when many risk behaviours first start. Concerted action in all sections of society and at all levels is needed to facilitate the implementation of prevention policies and programmes, including in schools and the workplace. Additionally, the effective use of law and regulatory measures to reduce the exposure to cancer risks including to tobacco, alcohol and unhealthy foods, as well as environmental exposures, should be integrated within a comprehensive health systems approach to cancer and NCD control. Additionally, governments should implement and enforce international labour standards for occupational safety and health, particularly those regarding occupational cancer and asbestos; see Convention concerning Safety in the Use of Asbestos. The World Cancer Research Fund (WCRF) network has been a pioneer in research and health information on the link between food, nutrition, physical activity and preventing and surviving cancer since 1982. WCRF’s Continuous Update Project is an ongoing programme to systematically analyse cancer prevention and survival research related to diet, nutrition and physical activity all over the world. The analyses are conducted by a dedicated team at Imperial College London and interpretation and judgement is carried out by an independent panel of world-renowned experts. The findings are published as Expert Reports. The conclusions of the panel of experts have been used to develop a blueprint for living healthily to reduce the risk of cancer: the Cancer Prevention Recommendations. Although well-informed individual choices are important, many factors, such as the availability of different foods and the accessibility of physical environments for active ways of life, are outside people’s direct personal control. In order to effect change at a population level it is therefore critical to consider the environment within which people make their choices. The WCRF evidence-based recommendations can help direct, shape and stimulate the required concerted action from governments to develop and implement evidence-informed policies to promote healthy lives. WCRF have developed a new policy framework for promoting healthy diets, physical activity, breastfeeding and reducing alcohol consumption, building on our unique NOURISHING framework and policy database to promote healthy diets and prevent overweight and obesity.